These days, having access to the internet at all times is expected. For the most part, our cellphones provide us with connectivity while we’re out in the great outdoors, and we rely on WiFi while we’re inside. Unfortunately, cellphones are a pretty expensive way to get access to the internet. If there is WiFi available, most consumers would prefer to use that over their mobile network provider. If you’re looking to get a network set up outdoors, your first instinct might be to purchase the biggest, baddest, most powerful router that money can buy. But this isn’t necessarily the case. The latest networking standard – 802.11ac – is considered to be a massive improvement over 802.11N. It can handle massive bandwidth, and has better signal penetration through walls. Believe it or not, 802.11ac is actually worse for an outdoor network. Higher bandwidth for each client means that less clients can be connected at the same time. Better penetration through walls means that the range is shorter. 802.11N is older technology. And if you take a router from a few years ago and pit it against a modern router, the modern one will perform better. But if you get a specially designed outdoor range extender, you’ll be able to create a network that will blow away any indoor router. In this guide, we’ll show you the three best WiFi range extenders for outdoor use. First, we’ll look at each individual model and show you what it has to offer. After, we’ll help you find the one that’s right for you. Although EnGenius makes a large number of routers and other networking appliances, they’re not a brand that everyone is going to be familiar with. EnGenius tends to go against the grain, creating specialty hardware designed for specific purposes. Though they aren’t a household name, there are very few brands we’d trust more to make an outdoor WiFi extender. How a range extender is designed has a huge impact on your installation process. In some cases, the costs associated with installing a poorly designed extender can greatly outpace the cost of the extender itself. Fortunately, EnGenius made sure that this process was simple with the ENS202EXT. All you need is four screws and a plug. It runs off PoE – meaning it pulls it’s power from the Ethernet cable that feeds it’s signal. As for the four screws? Put them in anywhere you like. With four anchor points, the router will be very sturdy wherever you choose to mount it. It’s IP55 rated, so it can handle even extreme weather conditions even without a separate enclosure. The actual configuration process is a little more involved than your standard router. First, you’ll have to plug it into a separate computer and configure things like the IP address for DHCP, the name, and the network rules. There is a wizard that walks you through it, but a little tech know-how is required. 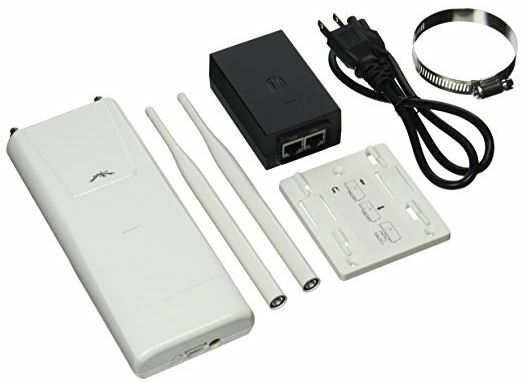 This extender is capable of using 802.11 B, G, and N. For 90% of users, N will be the best option. B & G are very old standards, but they can be amplified a higher rates. If you’re using a special directional antenna to transmit long distances, you’ll have the ability to do so. But even by default, this is a pretty impressive piece of kit. It’s antennas have 26 dbm of gain, allowing it to broadcast the network over a range of about 500 feet. In our tests, the connection speed was fantastic until the 300-foot mark, where things started to drop off a little. These are MIMO antennas, meaning that you have to separate 802.11 networks. This allows twice the number of users on a single extender, something that is worth having with such a long range. The range on this unit is wide enough that it can be used in a professional setting, so EnGenius gave it plenty of professional features. The POE feature can be extended allowing you to run wired IPTV cameras through the extenders. This is a huge advantage for anyone who wants a security system, as it drastically reduces installation costs. You’re also given tons of network security settings in the control panel. You can set up private VLANS, set private mac address filtering, install QoS systems that prevent one user from bogging the whole system down with a 4K Netflix binge. There is no doubt that this is an enterprise grade piece of hardware. Not everyone will take advantage of these features, but it does give you the option to manage a lot of users. Ubiquiti’s name is based off a word meaning “to appear everywhere,” which happens to perfectly describe what we want from our wireless networks. This access point is designed to be universal. You can use a single model to extend over a small range, or pair an entire array of them for a larger coverage. 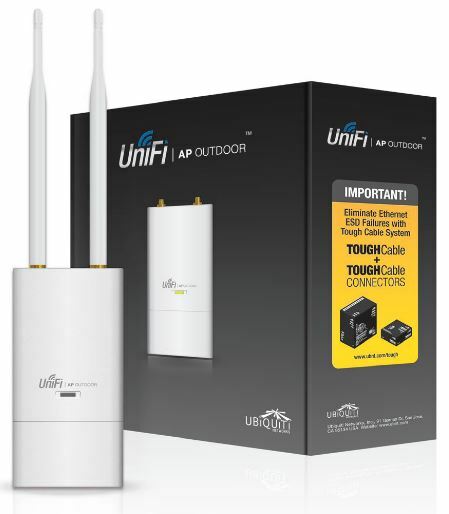 Although the installation process of the UniFi AP Outdoor+ is a little more involved with this access point, Uniquiti does give you many unique mounting options. The simplest choice would be to take the mounting plate and screw it directly onto a wall. It’s much easier to work with a single plate than it would be to try and make your screws line up with the holes on the access point, so you’re going to save yourself time and frustration with this design. If you’re trying to mount it up high to get a better signal, you’ve also got the ability to use the included hose clamp to strap it directly to a pole. Getting connected is also very easy. You just plug in your Ethernet cable and everything works. There is a pass-through, so you can daisy chain one access point to another to cover a large area. You don’t have to have an advanced technical skillset to set up a Ubiquiti access point. Just plug it in, and your network will be up and running. All settings are adopted from the host router, so there is no additional configuration required. 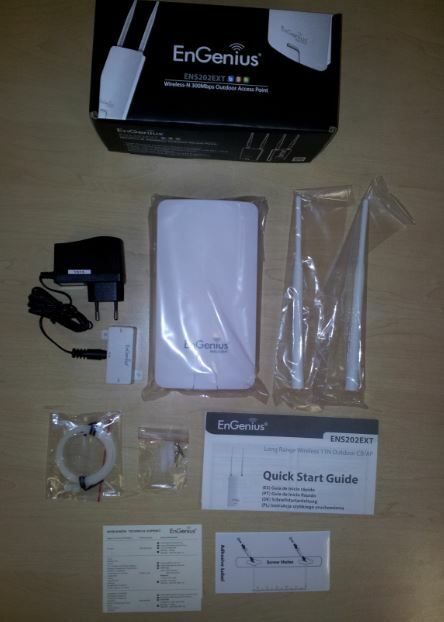 This access point uses 802.11N as its primary communication protocol. It is backwards compatible with other standards, but there are no special features available for long-range transmission. The advantage of this design is that this access point is very compatible. It will work with virtually any device you connect it to, so you won’t have to provide tech support for your clients. The omnidirectional antennas boost the signal at 23 dBm, which is just a tiny bit lower than the Engenius model. In our tests, the signal quality was good for about 250 feet, and the connection was extremely stable anywhere within this range. Although it’s not the highest range on the market, this access point does have a better system for handling high volume users. You’ll be able to connect quite a few devices before the network gets congested, making this the perfect choice for a dense installation. One of the standout features of this extender is the built in hotspot management software. You’re able to limit use, so users don’t bog down your network with unwanted activity. You can display your terms of service before the connection is active, and even set up a billing system where clients can pay for network access. There are plenty of 3rd party programs that do this, but they come at a hefty price. Having this included with your networking hardware is a huge advantage. Having been covered in many of our guides, TP-Link is a company that we are very familiar with. They made a name for themselves providing high performance networking hardware for the corporate and household market. This particular extender sets itself apart by combining long range and high performance technology, making this an ideal choice in situations where bandwidth is crucial. Although it’s possible to mount this directly to a wall, the TP-Link CPE510 will work best when mounted on a pole. The idea is to mount it high, and point the flat face of the extender in the direction that you’d like coverage. It’s extremely well made, so you don’t have to worry about winds or weather damaging it – ideal when it’s going to be fully exposed to the elements. Once it’s mounted, you’ll want to get it connected up to Ethernet. You can use the included power adapter, or TP-Links POE adapter. This is a little box that plugs into the wall next to your router. Your router plugs into the adapter, then the adapter to the extender. 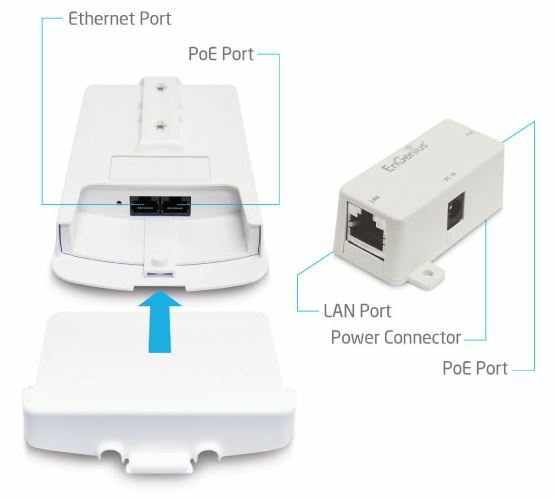 This adds POE to a non-POE network, allowing you to use any standard router. It’s worth noting that this isn’t standard POE, it’s TP-Link’s own design. The adapter is simple to configure, but it’s mandatory. The next step is to log into the repeater by typing it’s IP address into your web browser. You’ll be brought to the interface for the Pharos network management software. 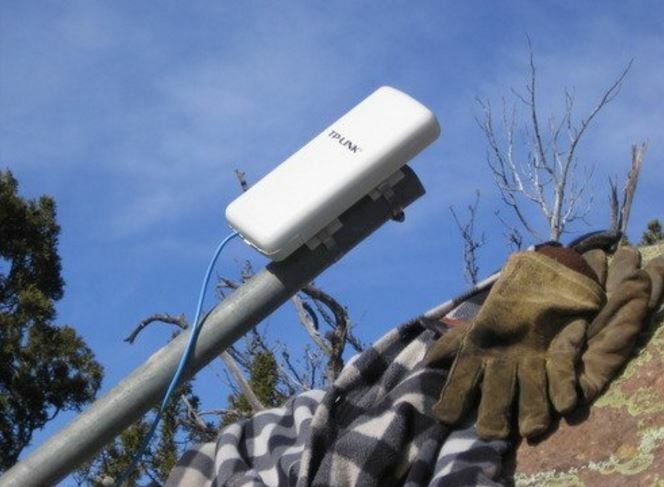 This is the simplest, step-by-step way to configure your outdoor network. We’ll get into the features shortly, but Pharos is the simplest way to set up an advanced network without a lot of advanced knowledge. 802.11ac uses both the 2.4 and 5 GHz frequency bands to work out a compromise between bandwidth and range. TP-Link does the same thing, with a catch. It runs on 802.11n/a, substituting the newer c standard for the classic N.
Typically, this would reduce the range. But TP-Link got around this by making the network directional. Instead of expanding out from the extender in a circular manner, it covers 180 degrees in front of it. The end result is a network that covers roughly the same area as other extenders – 300 feet. However, you get the added advantages of high bandwidth. The setup we described above is how the CPE510 comes standard. If you dive into the Pharos network management software, you can do more with this extender than you can with any other. Instead of setting it up as just an access point, you can set it up as a client. This means that it will receive a signal wirelessly, and rebroadcast it in another direction. This means that you don’t have to wire it into your router, although you do need to place it in an area where you already have a strong wireless signal. You can also use it as a router, creating a separate subnet for all of the clients of this access point. Overall, this is much more than your standard wireless extender. It’s an all in one long-range outdoor router, so you can create configurations as advanced as you like. I need one that uses WiFi connection not a hard wire Ethernet connection. Is there a solution? I’m looking for something similar. Thanks for your article, it helped quite a bit. We have two metal buildings, say 200 ft. apart. Only one building has internet access. 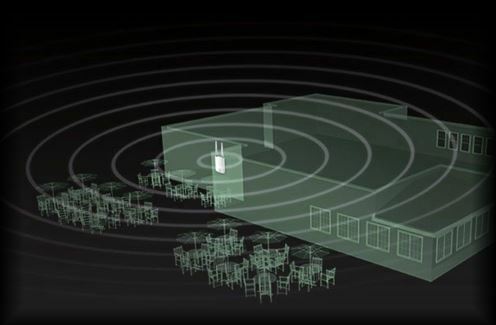 Would two of the TP-Link CPE510 devices pointed directly at each other provide a usable extension of our wired network in the receiving building? In other words, would this be the same as running a connecting ethernet cable across the way, only a little slower? Any advice would be appreciated. Thanks. Ok here’s my challenge I’d like to set 2 wireless security cameras on my property. One that monitors my patio, and the other one will be installed on my garage facing My back door. My cable router/WiFi is in my basement. My garage is approximately 30′ from my brick home. What would provide the best wifi signal to the exterior cameras. Currently when I have my cell phone outside next to my garage and look at my WiFi . It’s fairly weak. Fantastic review, I appreciate the time you’ve spent putting details of these devices together. It appears the range limit for these devices is ~300′. I would be thoroughly interested in another review like this, with a focus more on extending a wireless network over thousands of feet, instead of hundreds (I intend to use solar to power repeaters/end-points). I have a router that works fair in our large house. I would like to extend the WiFi out to the yard. I built a “she shed” for my wife, who loves being connected, and it’s about 70 yards from the house. From our bedroom upstairs I tried a repeater that takes the existing WiFi signal and broadcasts it out through the glass window. Even though it is direct line of site to the shed, it is too weak to go the distance through the window and 70 yards. Any ideas how to do this? not much obstruction from the downstairs location of the router in the family room, or very direct clear line from the upstairs.